Eating healthy doesn't have to be sacrificed because of your busy schedule, it just takes a little planning. 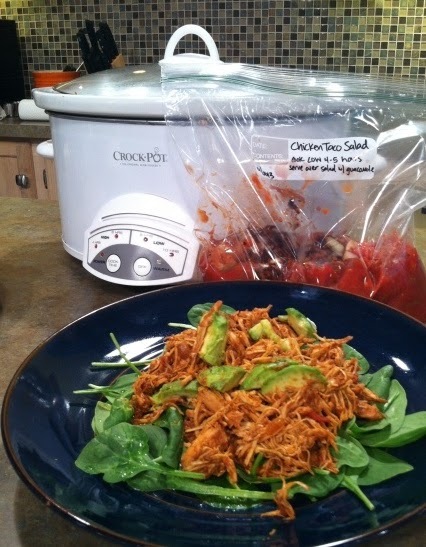 Crock pot meals are quick and easy, especially if you make up a couple of healthy dinners ahead of time. On Sundays, we buy enough ingredients to make a few meals, place in labeled plastic bags and store in the freezer. Then thaw, place in the crock pot in the morning and we have a healthy meal waiting when we get home from work. Place all ingredients in a gallon-size freezer bag, including raw chicken, label with instructions and store in the freezer. When ready to eat, thaw in the refrigerator for 24 hours, then cook in a crock pot on LOW for 4 - 5 hours. Shred meat with a fork, serve on lettuce or spinach with guacamole, tomatoes, olive oil and some lime squeezed on top. Place all ingredients in a gallon-sized freezer bag, label with instructions and store in the freezer. When ready to eat, thaw in the refrigerator for 24 hours, then cook in a crock pot on LOW for 6 - 8 hours. This recipe is gluten-free, dairy-free and paleo. Chicken can be stored in the freezer bags raw, any other meat should be cooked first. People strive to find dishes that provide delightful and sensible food. Health-conscious people focus on preparing low-fat dishes that are delightful and easily prepared. Poultry is full of protein and at the same time low in fat. Using healthier chicken dishes will significantly lower the blood cholesterol, thereby improving your overall physical health and fitness level.